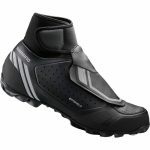 The Enjoy Cycling Shimano MW5 Dryshield SPD Shoes Review starts with what I thought was a bargain. On a recent visit to Decathlon Sports in Stockport I noticed that these shoes were reduced in price. Retailing at over £110 at places like Evans Cycles the Decathlon price of only £79.99p looked a bargain, or so I thought. The shoe is designed to keep your feet warm and dry, and with a sealed sole and Velcro fastenings they certainly look the part. The problem with my current shoes is that the hole for the cleat lets in water and although great for every day cycling, they are not an all weather shoe so the MW5 was exactly what I was after. The first impressions of the Shimano MW5 Dryshield SPD Shoes were that they were comfortable. They are easy to put on, fasten and they offer plenty of support while riding. I bought them just in time for the recent cold spell names “The Beast from the East” so this was an ideal to try them out. The shoes certainly do offer that extra protection from the weather, my feet were a few degrees warmer but not toasty. I think that if they were combined with a good pair of socks then your feet would stay warm on longer rides. My initial few rides were on cold days and so far so good, I liked shoes and I looked forward to a rainy day to put them through their paces. The first wet test came on a snowy day, wet slushy roads, ice and blizzard conditions meant that this was a true test of the so called Dryshield. After a mile or so it became apparent that although the sole and shoe is waterproof to a certain extent, the dry seal around the ankle is not. After a short time water made its way down my legs and in to the shoe. By the time I finished my 4 mile commute both feet were soaked. I understand that this is hard to combat as the seal round my leg will never be 100% and it was something I could live with. After 3 weeks of use I noticed that the stitching on the upper flap was starting to come apart and soon after the flap ripped when I took off one of my shoes. This rendered the shoe useless and after only 3 weeks I took them back to Decathlon for a full refund. In all they are a comfortable, warm shoe but they are not great in extreme conditions and the poor build quality means that I do not recommend the Shimano MW5 Dryshield SPD Shoes.